Tension has recently developed between Iran and the Gulf states, particularly Bahrain, in the wake of an op-ed by the editor of the Iranian daily Kayhan, Hossein Shariatmadari, who is an associate of Iranian Supreme Leader Ali Khamenei. The op-ed, which depicted the Gulf regimes as "not legitimate" and claimed that Bahrain is an inseparable part of Iran and should be returned to it, provoked angry reactions in the Gulf. Iran's official response to Shariatmadari's piece was that it did not express Iran's official position but only a personal view. Nevertheless, Iran attempted to alleviate the resulting tension with the Gulf states through diplomatic channels. In a visit to Bahrain during which he met with Bahraini Foreign Minister Sheikh Khaled bin Ahmad Aal Khalifa, Iranian Foreign Minister Manouchehr Mottaki refused to apologize for the piece, saying that the Iranian government did not accept Shariatmadari's statements, and that "Iran and Bahrain respect each other's national sovereignty and territorial integrity." The Bahraini foreign minister responded that Bahrain had received official guarantees from Iran alleviating concerns aroused by Shariatmadari's statements, and that there was no need for any apology from Iran. Despite diplomatic attempts to settle the upheaval, irate responses continued to reverberate throughout the Gulf states and Bahrain, particularly angry condemnations of Iran and calls for it to stop issuing pronouncements that aggravated the tension in the region and to respect the sovereignty of its neighbor states. In Iran, while there were some expressions of support for Shariatmadari's piece, on the grounds that its premises were "historically true," there were also statements that the piece should not have been published because such remarks could harm Iran's interests. Hossein Shariatmadari's controversial July 9, 2007 op-ed in the Iranian daily Kayhan was a response to the closing statement of the GCC foreign ministers' summit, which stated, inter alia, that the three Gulf islands Greater Tunb, Lesser Tunb and Abu Moussa belonged to the United Arab Emirates. Shariatmadari wrote: "Member countries of the Cooperation Council of the Arab States in the Persian Gulf, [namely] Saudi Arabia, Kuwait, the UAE, Bahrain, Qatar, and Oman – none of which dates back more than 100 years – are [all] well aware of Iran's absolute sovereignty over the three islands, which is rendered unassailable by [relevant] documentation. Thus [these countries should] not imagine in their wildest dreams that this sovereignty will ever change..."
"The governments of all [the Gulf States] were established by direct intervention of the forces of arrogance [i.e. the West, led by the U.S.]. The people [of the Gulf States themselves] were not [allowed] to be involved in the appointment of their government, in policy making, or in the decision-making [process] in their states. Furthermore, all the member governments in this council [i.e. the GCC] are accused by their people of collaborating with the Zionist regime, or, at the very least, of indifference to that regime's crimes against the oppressed Palestinian people. The heads of these governments are well aware that in the age of the Islamic awakening – which follows the model of the Islamic Revolution – it is unacceptable for one family to rule over the fate of an [entire] people and plunder national resources. [The heads of those governments] believe, and rightly so, that the [emulation] of the Iranian model is bound to bring about the fall of their unlawful regimes. Consequently, they have adopted hostility to Iran as one of their strategic goals. The danger of such a position − not to Iran, but to their continued rule [− cannot be underestimated]..."
In a July 13, 2007 interview, Shariatmadari defended his position, saying that his piece reflected "the opinion of the majority of Iranian people, and even of the people in Bahrain." In another editorial, published July 15, 2007, he reiterated his claim that Bahrain was an inseparable part of Iran, saying: "...Indisputable official documents show that... the island of Bahrain was until several decades ago a province of Iran, and was [subsequently] separated from it through a [joint] conspiracy by Mohammed Reza Pahlavi and the American and British governments..." In addition, he argued that the Persian Gulf states were insisting on "opening another front against Iran..." In July 17, 2007 Kayhan interviews, several Basij officials voiced support for Shariatmadari's claims, saying that "Kayhan's stand with respect to Bahrain is absolutely sensible and appropriate." Support for Shariatmadari: "Most States in the Region Were Once Part of Iran"
"At present, Iran has no complaint against [the sovereignty] of these states over [their] lands... However, every so often the neighboring countries, and especially the UAE, come up with unreasonable claims, which are bound to result in war and conflict in the region... The Arab countries in the region are taking advantage of the U.S. presence [in the Gulf region and Iraq] and of their relations with the West... In its talks [with other GCC countries], the UAE must not be allowed even to raise the question of the three Iranian islands. The arguments presented in Kayhan are correct, no matter who wrote the article. 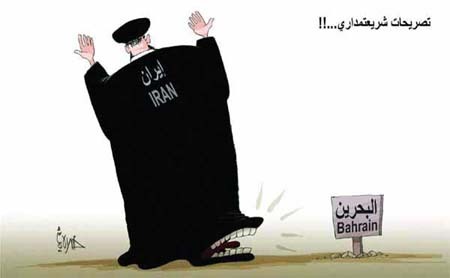 Bahrain did once belong to Iran, but today Iran has no claim to [sovereignty] over it." In its July 15, 2007 editorial, the reformist daily Etemad-e Meli, which is affiliated with the reformist party of the same name headed by former Majlis speaker Mehdi Karroubi, stated: "These gentlemen [i.e., the leaders of the Gulf states] should brush up on their history. If we decide to focus on history… many of the countries will be harmed. Iran is a descendent of ancient governments and great empires. Maps of the Achaemenid, Parthian, Sassanid, Safavid, and Afsharid, and even Zand and Qajar, empires have not yet been destroyed. [Nevertheless,] the great Iranian nation today lays no claim to a single inch of its land that is [now] under the rule of other governments or nations. At the same time, should there be a decision to reopen the case of the [three] Iranian islands, Bahrain [will] not be very satisfied. If [the Gulf states] harm even an inch of Iranian soil, the Persian Gulf will be inundated with blood, and the political map of the area will in all likelihood change. This [change] will hurt the nations in the region, particularly the governments of small Arab states. Accordingly, let us be wise, and not play with the lion's tail, [that is, of] Iran." In contrast, views were also expressed within Iran opposing Shariatmadari's piece, and arguing that pronouncements like those in his article did damage to Iran's foreign policy and interests. A senior official at the Iranian Embassy in Bahrain, Reza Henrou Naziri, stressed to the Bahraini periodical Al-Waqt during an interview that Shariatmadari's pronouncements were "unacceptable and harmful to [Iran]-Bahrain relations." He stated that "Iran respects Bahrain's sovereignty and independence, as well as its Arab [identity]." Senior Iranian Foreign Ministry official Javid Ghorban Oghli posted, on the Baztab website, an article criticizing Shariatmadari's piece: "A daily associated with Supreme Leader [Ali Khamenei] must not act in a way that will cause tension and crisis in [Iran's] foreign affairs… Under the circumstances… responding to the GCC announcement does not justify instigating an unnecessary crisis." On July 16, 2007, Mashallah Shams Alvaezin, spokesman for the Society for the Protection of Free Press in Iran, wrote in the reformist daily Sharq: "The new crisis in Iran-Bahrain [relations, which erupted] over the Kayhan editorial, has demonstrated yet again the harm that rash and irresponsible statements can cause to the national interests and foreign policy of [any] country… Senior political officials, especially if their work is related to national security, should not take this affair lightly. The foreign minister's prompt response by conveying [a message] to the Bahraini capital Manama, as well as Iran's insistence on [maintaining] a consistent policy in the region, were steps that were appropriate and praiseworthy, albeit insufficient. It is necessary to identify the source of the radical tendencies regarding territorial issues, especially in matters of national security [i.e. Shariatmadari], and to remove [the individual in question] from a position of influence…"
Shariatmadari's statements caused a storm in Bahrain. In the Bahraini capital Manama, dozens of protesters assembled in front of the Iranian Embassy chanting slogans condemning Iran and demanding an official apology from the Iranian government. Bahraini Foreign Minister Sheikh Khaled bin Ahmad Al-Khalifa summoned the Iranian ambassador and made it clear that Bahrain expected Iran to issue an official objection to Shariatmadari's claims. Bahrain's two houses of parliament, the Shura Council and the House of Representatives, strongly condemned Shariatmadari's article, describing its arguments as "fairytales that have no basis in reality," and called upon Iran's government to honor international decisions that endorse [Bahrain's] Arab identity and independence. The parliament further demanded that Iran desist from making such announcements, in order to prevent additional tension within the region. Bahraini Parliamentary Council for Foreign Affairs, Defense, and National Security chairman Sheikh 'Adel Al-Mu'awada demanded that Iran officially apologize for Shariatmadari's words, since, he said, they represent the official position of the Iranian regime. Several parliament members even insisted on expelling the Iranian ambassador, recalling Bahrain's ambassador to Iran, and lowering the level of diplomatic relations with Iran. Salafi Sheikh and MP Jasim Al-Sa'idi called for terminating diplomatic relations with Iran, even issuing a fatwa stating that anyone who believes in the truth of Shariatmadari's words should be considered Khawarij, and as such must be "punished by death, unless he repents within three days." Shariatmadari's op-ed triggered a wave of criticism in the Bahraini press. Journalists called upon Iran to stop using threats as a way of relieving pressures from within and from without, and to respect the sovereignty of its neighbors. "Bahrain will never agree to fall victim to the mistaken policy of the Iranian regime. Bahrain would suggest to Iran that the way to end Iran's international isolation is not through provoking Bahrain and [other] Gulf states... Bahrain will not agree to declarations of this kind, which are at odds with international conventions and with [the rules of] neighborliness. The Arab Gulf states must unite their ranks and positions, and clearly declare their objection to all Iranian threats... Bahrain is an Arab state and will remain an Arab state..."
"On what grounds are you accusing the Arab Gulf regimes of illegitimacy?... Aren't these regimes, which you view as illegitimate, the [very] ones that Iran has recognized and with which [Iran] has exchanged ambassadors?... Could it be that everything that we heard has come from a man who speaks nonsense?... You [must] realize that since the dawn of history our region has been entirely Arab, just as yours has been Persian!..." "With its political orientations, Iran... has not been able to convince the world of its peaceful intentions... because its behavior, provocative declarations, and continuous attempts to interfere with its neighbors' internal affairs... lend a hideous image to the Iranian regime..."
The following cartoon appeared in the Bahraini daily Al-Ayyam on July 12, 2007. The text reads "Shariatmadari's statements." Shariatmadari's statements triggered harsh criticism in other Gulf states as well. GCC Secretary-General 'Abd Al-Rahman bin Hamed Al-'Atiyya stated that Shariatmadari's claims "have no connection whatsoever to reality or truth," and that they were intended to "harm the Gulf States and their sovereignty... to incite [the population], and to instigate civil war." Numerous articles in a similar vein appeared in the Gulf press, which condemned Shariatmadari and was of the view that his declarations were an expression of Iran's aggressive attitude towards all the Gulf countries, as well as evidence of the Iranian regime's imperialistic aspirations. "This is an appeal to the Gulf states to consolidate their security strategy in order to deal with external challenges and aspirations. GCC members should have a unified military defense [strategy]. In addition, they must form military alliances and agreements, on a regional basis, with strong and prominent Arab and Muslim countries such as Turkey, Egypt, and Pakistan, as part of a regional defense strategy..."
"Why on earth have [the Iranians] produced from the Shah's storerooms the trump card of demanding the return of Bahrain [to Iran] – unless [it is part of] efforts by the mullahs' regime to start fires all over [the region] in an attempt to make the Iranian people forget their hunger and poverty, and to divert the attentions of the International Community away from the Iranian issues in Teheran, Kabul, Baghdad, Beirut, and Gaza?..." "Iran could have been expected to try to improve and mend its relations with its neighbors and to restore the mutual trust that has been lost. But [instead] it is unnecessarily heating up the atmosphere, thereby causing serious damage to future relations with its neighbors... In addition, it will lose all tentative manifestations of support for its rights to the nuclear project. "After all [that has happened], no one will believe that [Iran] will ever renounce its aspirations to its [allegedly] peaceful nuclear program. On the contrary: [These aspirations] will become a real threat to the [neighboring] countries. Nuclear power will turn Iran into a coercive force that attains its aspirations without fear of any objection... These declarations reflect a strategic plan, which reveals [only] a small part of what Iran will be capable of doing should it have nuclear weapons at its disposal..."
The following cartoon appeared in the Saudi daily Al-Watan on July 19, 2007. 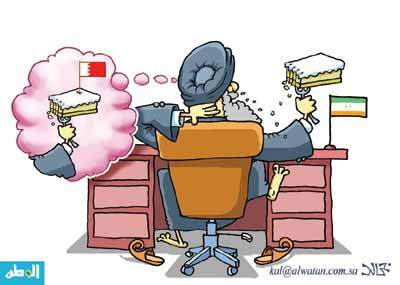 With the Iranian flag on his right, the Iranian official dreams of the Bahraini flag. * Y. Mansharof and I. Rapoport are research fellows at MEMRI. Akhbar Al-Khaleej (Bahrain), July 15, 2007. Kayhan (Iran), July 9, 2007. ISNA (Iran), July 13, 2007. Kayhan (Iran), July 15, 2007. Kayhan (Iran), July 17, 2007. Aftab (Iran), July 15, 2007. However, Parliamentary Committee for National Security and Foreign Policy chairman Ala Al-Din Boroujerdi explained that Mottaki's visit to Bahrain was intended to stop the U.S. policy of destroying relations between Iran and its neighbors. Aftab, July 17, 2007. That is, empires that ruled Iran's territory from the 6th century B.C.E. until the 20th century C.E. Al-Waqt (Bahrain), July 12, 2007. Baztab (Iran), July 16, 2007. Sharq (Iran), July 16, 2007. Al-Quds Al-Arabi (London), July 14, 2007. Al-Sharq Al-Awsat (London), July 12, 2007. Akhbar Al-Khaleej (Bahrain), July 12 and 13, 2007. Al-Sharq Al-Awsat (London), July 15, 2007; Akhbar Al-Khaleej (Bahrain), July 12, 2007. Al-Siyassa (Kuwait), July 13, 2007. Al-Watan (Bahrain), July 13, 2007. The Khawarij were a group that separated from the forces of Fourth Caliph 'Ali Ibn Abi-Talib during the battle of Siffin in 657 B.C.E., and they are considered the first Muslim opposition within Islam. Here, this term is used as a derogatory label for a secessionist group. Al-Ayyam (Bahrain), July 11, 2007. Akhbar Al-Khaleej (Bahrain), July 11, 2007. Akhbar Al-Khaleej (Bahrain), July 13, 2007. Al-Siyassa (Kuwait), July 15, 2007. Al-Ittihad (United Arab Emirates), July 20, 2007. Al-Yawm (Saudi Arabia), July 19, 2007.